The Goffs UK Horses-in-Training market at Doncaster produced another pleasing set of figures for today’s September HIT Sale as a big buying bench featuring purchasers from throughout Europe and the Middle East pushed the clearance rate to an outstanding 88%. A major draw card every year, the Gigginstown House Stud Annual Dispersal produced many of today’s highlights with it featuring a number of renowned performers which led to a packed Doncaster sale ring. Of the 35 horses offered, six sold for £35,000 or more and the draft was topped by the three-time winner and Grade 1 placed Hurdler All Hell Let Loose (Lot 151) who sold to Brendan Bashford Bloodstock for £62,000. Topping today’s sale was Jim Bolger’s Glebe House Stables whose sole entry, the race winner Meagher's Flag (Lot 179), sold to Tom Malone for £65,000. Other horses to feature in today’s sale included Camas Park Stud’s dual Bumper winning mare Stacey Sue (Lot 155) who sold to J.D. 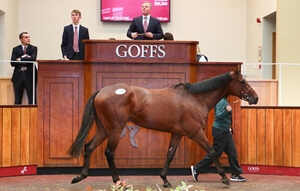 Moore and Alex Hales for £52,000 and Willie Mullins’ six-time winner Townshend (Lot 118) who was knocked down to the Million In Mind Partnership for £50,000. “We are delighted with today’s sale. The 88% clearance rate was very good and it was particularly pleasing to see another big crowd of domestic and international buyers descend on the complex for a quality day of Horses-in-Training. “The Gigginstown House Stud Annual Dispersal was undoubtably a major attraction for the sale with house hold names such as Road To Riches and Thunder And Roses offered and we would like to extend our thanks to the Gigginstown team, along with all our vendors and buyers, who made today a success.